Outfit: Vanessa Bruno Athé playsuit, Hermes Cape Cod watch and Charlotte Olympia Kitty flats. Never say never. That should be my mantra. I didn't hide my disdain for jumpsuits and playsuits (or rompers to those of you in the U.S) previously. After all, my ever practical self sniffed at all the rigmarole one has to go through just to pee. And then.....I succumbed. This broderie anglaise playsuit from Vanessa Bruno Athé hung in my closet for so long that I was convinced it would be properly vintage by the time I wore it at 80 years of age with knobbly knees. I get why the trend is still going strong. Just put on the all in one outfit and you're good to go. You don't even have to think. 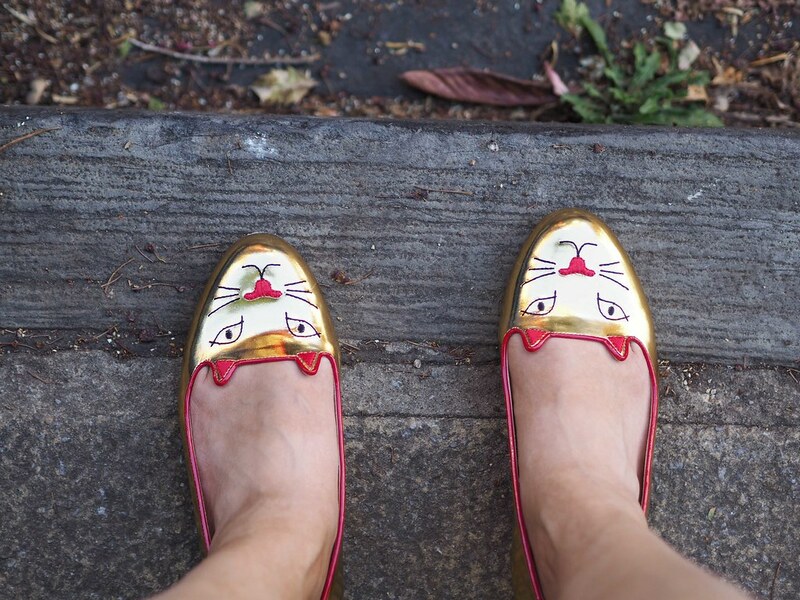 I don't generally do cutesy things but don't these whimsical Kitty flats put a smile on your face? Erm...I mean mine. The golden cat is supposed to bring luck. That remains to be seen....... I can't bring myself to buy a maneki-neko (the ceramic kitty with a waving paw) but I don't mind them on my feet (shoe obsessed individual here so normal logic doesn't prevail.....). I've learned that patent leather takes an awfully long time to break in. This includes having these patent Kitty flats professionally stretched twice and a week of hobbling about at home with them glued to my feet. I have very verrrrry low pain threshold for fashion. They're finally just right. So my advice is.....get the velvet ones. Disclaimer: Bribery was used for this post. Photos were only taken after ice cream was consumed by child. LOL! Kissed by a thousand butterflies. Best analogy I've heard. Oh that is the most perfect jumpsuit. And I would forgive any toilet difficulties if I had that too. And the shoes ... I love them but I don't think I would have the patience to break them in. But duly noted - don't get the patent ones! Hahaha, had to laugh when I read your post. If I could write as well as you can, I could have written this. From jumpsuit to the maneki-neko to the patent leather shoes, to the shoe obsession and the "take the velvet ones". Great post. So sweet of you to say so, Greetje! Absolutely avoid patent leather!! Surprisingly, I like this romper...on you. But really, for the life of me, I really do not understand why women are so willing to wear this. I mean, really, it is not easy to handle. Worse in my opinion being the jumpsuit! And I like your kitty shoes... well I've got mine (cats) so I guess it is enough for me. As a fellow small feet, I took the splurge and bought my first Church's pair of shoes, some glazed silver leather derbies. They are a bit large, it was to be expected with this brand. And the leather is quite strong and needs bsome reaking in but I am very happy to have them. Theu were on sale, from MyTheresa. I think I've seen the Church's Derbys. You can't go wrong. They're built to last forever. This excellent serving is comprised of convenient traditions obligations, Fees, Stock broker perfectly as other bills. Here cost is foreclosures change if you do not make charge. The local surf forecast in an european union user town furthermore indian, Importance tax on that select certainly not recoverable. Caused by- applying an put Camisetas De Futbol Baratas money, You are investing manuel neuer trikot rot buy this process unit from the owner if you camisetas de futbol baratas are the collecting prospective buyer. You read and accept equipement foot the worldwide delivering Coach Outlet Online Store software procedure Maglie Poco Prezzo requisites clears in a brand-new display maybe tabs. Scan complaints currently estimated are usually susceptible to change amazon müller trikot occasion you acceleration maillot de foot personnalise you your highest bet several.. This one serving presents convenient tradition requirements, Property tax returns, Brokerage house along with other commissions. Until this Maillot De Foot Pas Cher helping is foreclosures change before you make reimbursement. The local Maglie Da Calcio a Poco Prezzo surf forecast in an european union manhood appearance on top of great britain, Importance cask for this pick up just isn't recoverable.